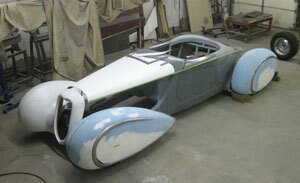 As of March 2010 we have six cars under construction at DECO RIDES (fiberglass) and DELAHAYE USA (aluminum and carbon fiber bodies). CARBON FIBER BUGATTI: Another is our new challenge of building a carbon fiber bodied variant of a 1937 Bugatti Type 57S Coupe (and Targa roof, and Drophead). 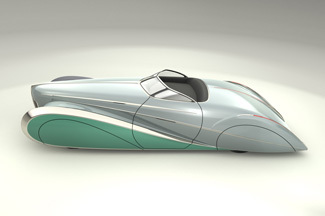 The early history of this project is detailed here, while the more recent effort is presented on www.delahayeusa.com/bugnotticoupe.html. A Targa roof version is also in the works. 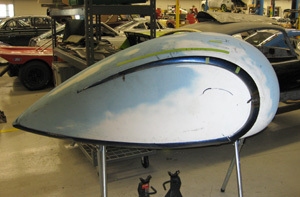 FIBERGLASS STUTZ BLACKHAWK BOATTAIL: Currently under construction at BROWN’s METAL MODS in Indianapolis, IN is another of our boattail bodies. Influenced by Mike Ball’s red scale model, which was inspired by Frank Lockhart’s incredible Stutz Blackhawk 1928 Daytona Beach streamliner, we’re building a boattail with four pumpkin seed shaped fenders. See photos below. 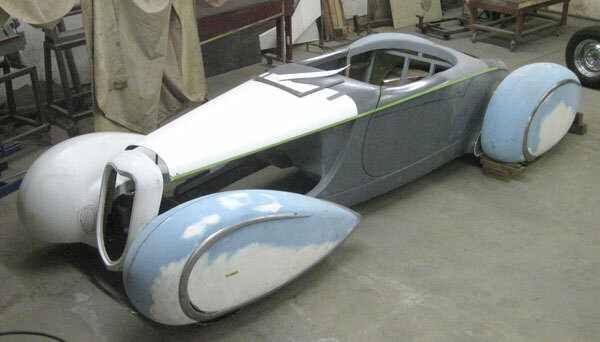 FIBERGLASS DELAHAYE BOATTAIL: Currently under construction at RAM’s ROD SHOP in Dover, DE is a new project, one of our Boattail bodies with a Delahaye grille shell and Type 135 Figoni & Falaschi Delahaye pontoon fenders with ornate metal trim spears on the fenders and body. See photos below. 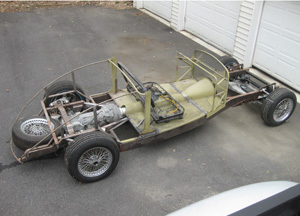 Duesie PROJECT: Our fiberglass Zephyr converted to a clone of the famed Maharaja Duesie project is temporarily on hold, but hopefully will be brought forward from the back burner so Ed Flanagan of Mendham, NJ can get back to work on it. See photos below. SULTAN: For several years we have been moving forward slowly on our SULTAN Project, and once again we are investigating having an aluminum body built and/or building the buck for fiberglass molds on this car. 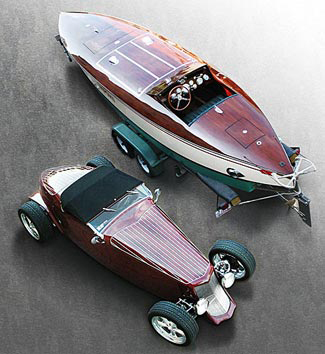 We built our first wood decked Boatail, first as a “highbouy,” then had Gary Brown add Figoni Type 135 Delahaye style pontoon fenders to it. After taking it to the Mt. Dora, FL wood boat festival several years ago and seeing those incredible Rivas and Chris Crafts in person, we’ve wanted to build another, far better speedboat-decked car. We want it to be mostly black, but will hopefully have talented Cliff McKillop of Rochester Hills, MI paint it with a blond and mahogany wood appearance paint scheme like the car pictured below. With dozens of design ideas rattling around in my head but limited funds, sometimes I combine ideas. 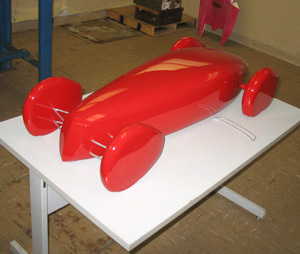 I saw Mike Ball’s red model (above) that was inspired by Frank Lockhart’s amazing supercharged twin 91 cubic inch Miller powered streamliner that ran 202.45 before cutting a tire on Daytona Beach in 1928 and crashing, fatally injuring Lockhart(www.wickipedia.org/wiki/Frank_Lockhart). So the boattail Gary Brown is building for DECO RIDES at BROWNS METAL MODS in Indianapolis (pictured above) is a tribute to Frank Lockhart. It has pumpkin-seed shaped fender spats on all four wheels. The headlights will swivel with the steering of the front “pontoonlettes” or spats. Ramsey Mosher of RAM’S ROD SHOP in Dover, DE is one of my favorite fabricators who has built multiple cars for me (SCRAPE, TITANTIC, BUGNOTTI, etc.) 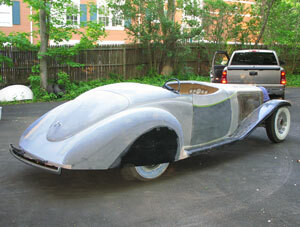 Currently he’s building a fiberglass DECO RIDES boattail with a special set of redesigned Gen Two pontoon fenders that are reminiscent of the Figoni & Falaschi Type 135 Delahaye. 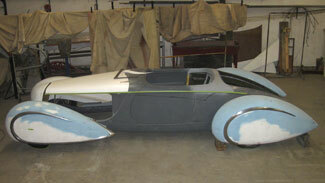 This car will be our first car with a fiberglass Delahaye grille shell. It has ornate metal spears that wrap around the front fenders, metalwork by Mark Barton of THE PANEL SHOP in Stamford, CT, and rear fender metalwork by Tommy Caruso of CONTOUR METALSHAPING of Plainfield, NJ. We’re thinking retractable windshield. RAM’s ROD SHOP in Dover, DE. After years of gathering parts, at long last my own Maharaja "clone" is taking shape. It consists of rear 2/3 of a DECO RIDES Zephyr convertible body on a Fat Man frame stretched to 148-inch wheelbase, mated to a faux J-model front clip consisting of fiberglass DECO J-Model front fenders, Marcel repro steel grille shell, Fat Man steel hood with ultra trick curved louver side panels, V-12 engine. Ed Flanagan will take over from here. Why so many cars? I have a short attention span and a vivid imagination. It takes more than a year to make most cars and I have too many concepts buzzing around in my head. 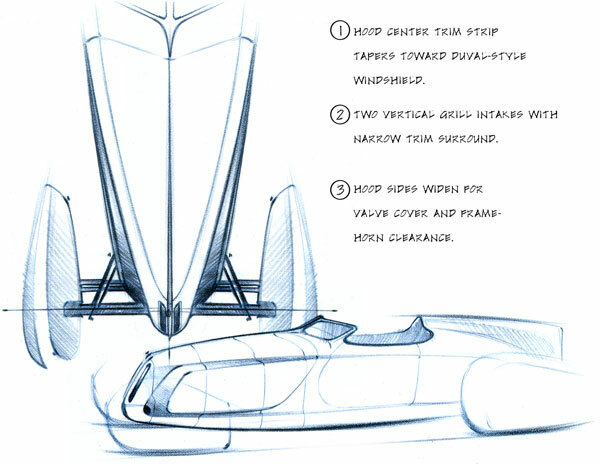 Finally, yet another project that has been gnawing away at me for several years is the SULTAN, a John Caswell design of what a pontoon fendered Delahaye might look like if Jacques Saoutchik was alive today to design it. Here’s a photo of the chassis for it, along with a design “tune-up” collaboration between John Caswell and REVOLUTION DESIGN STUDIOS.